There are places in the world so exceptional they do not require superlatives. They are best described with the simplext of words. Bellagio is such a place. A magnificent lake filled with thousands of fountains runs the length of Bellagio's grounds. Fragrant gardens and the red tile roofs of Tuscan villas line the water's edge. Stretching across the ceiling of the lobby is a sculpture of hand-blown multicolored glass created by the renowned artist Dale Chiluly. Nearby, a botanical conservatory is home to exotic plants and flowers. To ensure that every blossom is at the height of its color and fragrance, the garden will be replanted several time a year. Standard - 1 King or 2 Queen Beds. Lake View - 1 King or 2 Queen Beds. Guest rooms and suites testify to a single-minded devotion to detail, from classic armoires that conceal contemporary entertainment centers to the panoramic views afforded by each. Bellagio Suite - 1,020 square feet - 1 King sized bed. One Bedroom Penthouse Suite - 1,536 square feet - 1 King sized bed. 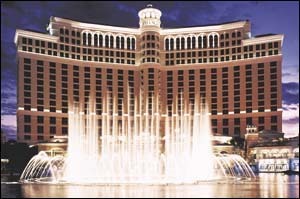 Suites at Bellagio are luxuriously residential in character with custom furnishings and amenities such as a VCR, fax machine, whirlpool bath, wet bar with refridgerator, separate climate control in master bedrooms and an assortment of spa productrs. Twice-daily housekeeping service is also provided to all guests staying at the bellagio. Each of the above suites hav two master bathrooms - His with a steam shower, hers with a soaking whirlpool tub. Other amenities in the suite bathrooms include cable television, telephones, separate illuminated makeup/shaving mirrors, robes and slippers. Color Cable Television, Stereo, In-Room Safe, Desk, Two-Line Phone, Game Table, Alarm.